The Girard-Perregaux Manufacture presents this seductive new version of its iconic Cat’s Eye collection, widely acclaimed for its magnificent aesthetic and mechanical features. 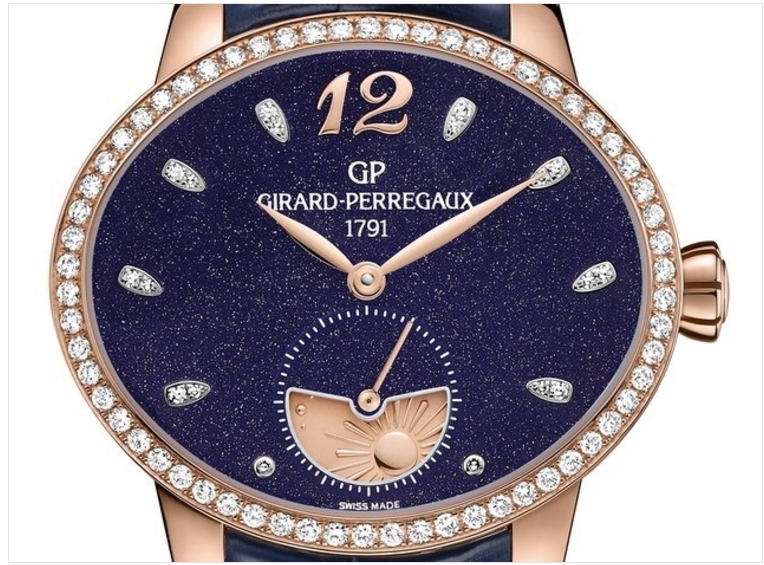 With its dark glittering color dial in aventurine that recalls a night sky full of starts, the new model Girard-Perregaux poetically marks out each hour of day and night as a precious moment. The beauty of this “Day & Night” model stylishly combines the curves of the Cat’s Eye case with a sophisticated manufactured movement. The complication is displayed in a feminine way : a shiny sun and a smooth moon appear on the 22 cts pink gold disc that completes a rotation in 24 hours.